This is another example of how changing a few ingredients--but using the same basic method--can create an entirely new dish (click here). I seasoned this with somewhat Mexican or South West spices, but even this could be altered...changing the spices to curry or Mediterranean herbs would create an entirely new dish. Anyhow, this is how to make it. Make a sort of sofrito by sauteing onion, green pepper, lots of garlic, and spices in olive oil (I used crushed hot pepper, smoked paprika, chili powder, cumin, and turmeric). 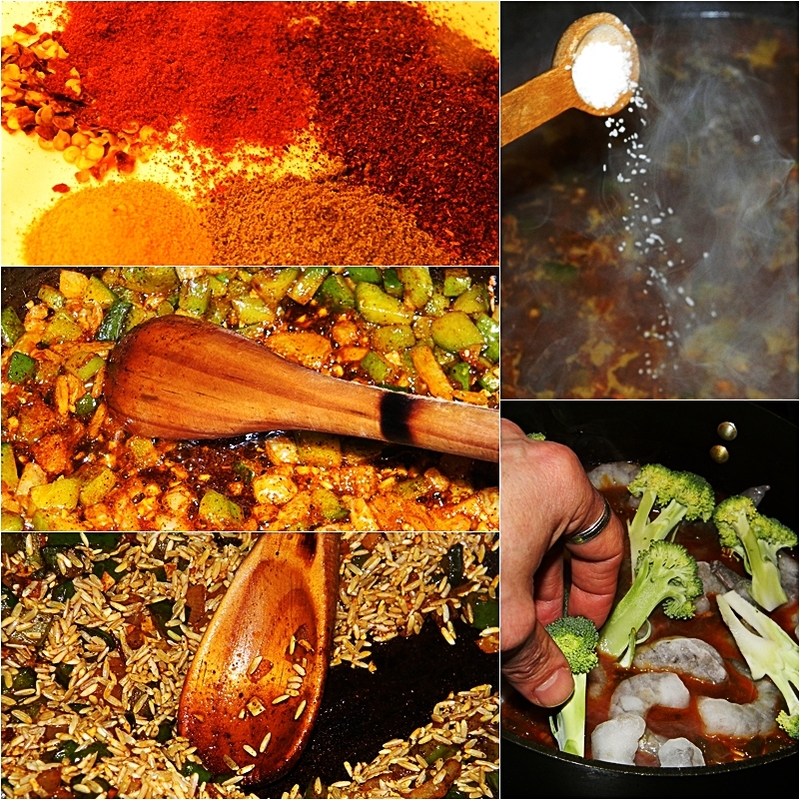 Them mix in brown rice and coat it with the oil and spices. Add simmering chicken broth (3 cups broth for every cup of brown rice) and season it with kosher or sea salt. Cover the pot and simmer the rice for about 30 minutes. 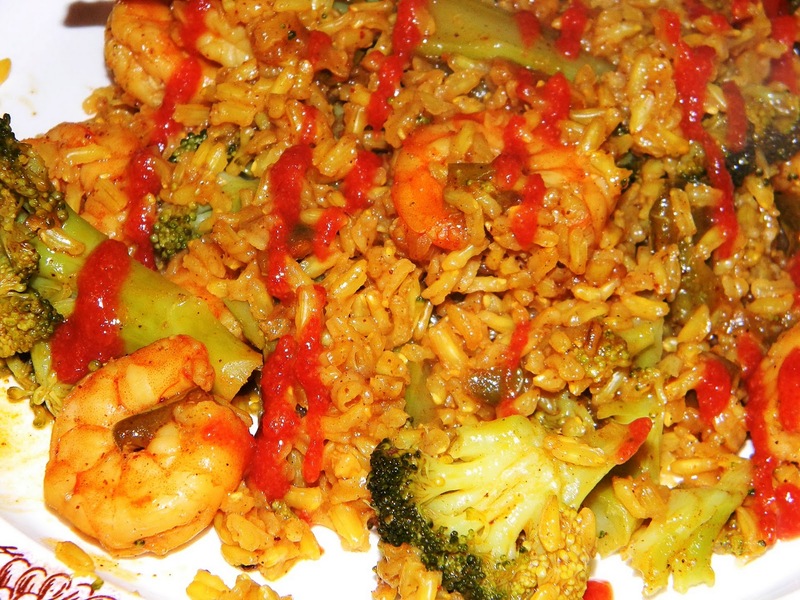 Then lay shrimp (or other protein, such as fish or chicken) on top of the rice, and broccoli florets on top of this (continued below). 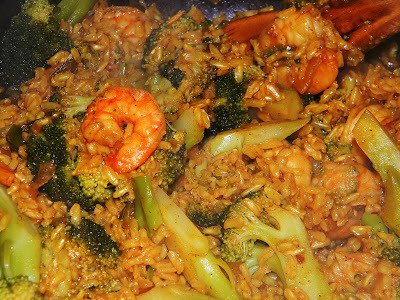 Cover the pot again and cook the rice/shrimp for another 5 or 10 minutes. Then check the rice and shrimp to make sure that it is cooked. Remove the pot for the heat and allow to rest for 5 minutes before serving. This is easy to prepare and super delicious and nutritious. In the picture below you can see that I also loaded my plate with Sriracha hot sauce (mmm...). Click any photo for a large view.